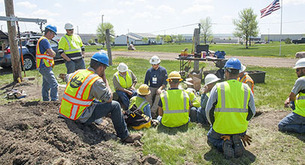 Minnesota Municipal Utilities Association and our partners—Minnesota Rural Electric Association (MREA) and American Public Power Association (APPA)—are pleased to bring you the 2019 Underground School. The Underground School offers a hands-on training track with a variety of training sessions and an advanced technical course. In addition to top-notch instructors, we strive to keep class sizes small to maximize participation and learning. Whether you are a seasoned Journeyman looking to stay current or are an Apprentice just starting out, this school offers something for everyone. Individuals registered for the Multi-Session Class will rotate through six different 2-hour training sessions, covering a variety of topics that can enhance safety and improve efficiency. NOTE: Members of MREA need to register on their site directly. The General Sessions are held on the first and last day of the School. Participants must attend these sessions to receive full credit for course hours. Learn about pre-assault behaviors both verbal and non-verbal. A variety of methods will be discussed on ways to calm a verbally aggressive or potentially disruptive individual. Learn how personal space, body language, and listening skills can help effectively de-escalate the disruptive behavior of those you may be dealing with. The ability to organize your thinking and calmly respond are effective de-escalation techniques that can help you avoid a potential crisis. This session is intended to provide work zone employees with an understanding of the most basic aspects of safety in a work zone and to encourage them to develop safe habits. It begins with how a worker should prepare before entering the work zone, and it doesn't end until the worker is off site and out of the work zone area. The session will also cover important DOT regulations that must be followed. Registrants will rotate through each of the following six sessions (does not include Advanced Class). This class is intended for lineworkers of all experience levels. This session is designed to give individuals a better understanding of locating URD cables. Participants will be able to work with various brands of locators and learn different techniques, including locating bad secondaries using an A-frame locator. For utilities looking for a reliable alternative to compression connections, 3M offers the shearbolt connectors, QCI Series. 3M’s Jim Stephens, will offer useful tips as he instructs on the proper technique for terminating a splice. Attendees will also participate in other terminations to ensure understanding and to reinforce comprehension. Secondary troubleshooting can be a hassle at times. This session is designed to give participants a better understanding of different scenarios--including back feed and open neutral situations. Partial power scenarios will also be discussed and worked through with hands-on exercises. Proper testing of connections, phasing, tagging and installation of secondaries will also be covered. The use of infrared technology is becoming more and more crucial. Understanding the technology and how to properly use it can make a big difference in the process. This session will go over the fundamentals of infrared: how it works, key factors in obtaining images, software and ways you can apply the information. There are many times where utilities need to expose existing energized cables. This hands-on session will cover the proper way to do so using backhoes, vacuum excavators and shovels. Once the wires have been exposed, participants will be taught the proper method of backfilling around these wires. In this classroom session, participants will hear and discuss an accident that recently happened in Minnesota to a lineman on a storm job. This accident, and others that have occurred around the state, will be broken down, analyzed and thoroughly discussed. Topics to be covered include best practices, PPE use, job briefings, proper steps to ensure a safe work environment, and more. This two-day session will be packed with intense training and will move quickly to cover all the information listed. This class is designed for seasoned lineworkers, managers, engineers and others who can benefit from the information. *Schedule/program subject to change without notice. This mystery event is open to all classes of lineworker, from first-year apprentice to the advanced journeyman. This is a fun event which demonstrates safe working practices and a little speed. A trophy will be awarded to the person with the best time and fewest infractions. The reception offers participants an opportunity to connect with friends old and new after hours and enjoy free pizza and a beverage. Location: The Gambler in Marshall. At participant’s expense, we will arrange a fun evening of golf at one of the local golf courses in the Marshall area or an evening of sporting clays at Shooter’s Gun Club. Participants will receive a certificate of achievement. Watch for an email notification from MMUA after the event. For a map of hotels in Marshall, click HERE. The AmericInn by Wyndham and Ramada have special pricing. Just ask for MMUA's reduced rate. Registration fee includes: workshop tuition, materials, refreshment breaks, pizza reception, two lunches, and a certificate of achievement. Participants are responsible for their own transportation and lodging. Deadline to register is April 22, 2019. MMUA will issue a refund on advance registrations (minus $30 processing fee per person) provided MMUA is notified by 4:30 pm on April 22, 2019. No refunds after April 23. If you have questions about the program and its content, contact Cody Raveling by email craveling@mmua.org or phone 507.380.9578. If you have questions or problems with registration or reservations, contact Theresa Neddermeyer by email tneddermeyer@mmua.org or phone 763.551.1230. A printable version of the workshop brochure is also available.